The RP Photonics Buyer's Guide contains 10 suppliers for beam dumps. There are various situations in which one has a light beam, typically a laser beam, which is unwanted either temporarily or at all times, and therefore needs to be blocked – for example, for reasons of laser safety. For such purposes, one can use some kind of beam dump which safely absorbs the optical power. In contrast to a beam shutter, a beam dump cannot be deactivated – to release the beam again, the device needs to be removed. When some kind of pump laser sends a beam to another device (e.g., a titanium–sapphire laser or an OPO), on which one needs to temporarily work without the pump light (e.g. cleaning some mirrors), one may insert a beam dump between the devices (instead of turning off the pump laser). One may need to permanently block beams resulting from parasitic reflections or transmissions. For example, even highly reflecting mirrors in a high-power laser may transmit a significant amount of optical power due to the high circulating intracavity power. Such parasitic beams may cause laser hazards or other problems, for example heating up the holders of some laser mirrors and thus causing thermally induced misalignment. Some optical devices produce unwanted beams. For example, the non-diffracted beam of an acousto-optic deflector or one of the outputs of a polarizer in a variable optical attenuator may need to be dumped. A kind of beam shutter for very high power levels can be realized with the combination of a beam dump and a movable mirror, which can be moved into the beam to send it to the dump. The perhaps most essential function of a beam dump is to avoid any of the light to be transmitted on its regular path. That purpose alone can be fulfilled with a simple beam block – for example, a metal part with a black coating (absorbing coating, e.g. anodized aluminum) and possibly some cooling fingers. Such parts are often home-made. Strongly suppressing scattered light needs somewhat more refined designs. In some cases, it is also important to strongly suppress any reflected and back-scattered light. For example, even a minimum fraction of scattered light from a kilowatt laser beam could be problematic in terms of laser safety. A simple beam stopper may then not be sufficient. Therefore, various kinds of beam traps have been developed which have somewhat more sophisticated setups. For example, there can be a cone-shaped black part into which the beam is sent. Most light which is reflected or scattered despite the absorbing coating reaches other parts of the black cone. Further, in front of the cone one may place some kind of cavity or tube which is also black inside. Optimized optical traps of such kinds send virtually no light back towards the source, at least when operated within the specified range of operation wavelengths. Beam dumps for use with high-power laser beams have to dissipate substantial powers, which are turned into heat. For powers up to a few watts, it is normally sufficient to have some kind of cooling fingers attached to the absorber, which can release heat both by convection of air and by heat radiation. Note, however, that beam dumps can become rather hot during operation – sometimes reaching temperatures above 100 °C. Substantially increased powers (sometimes hundreds of watts) can be dissipated with fan-cooled devices. Possible disadvantages are, besides the somewhat higher cost, that possibly disturbing air flows and vibrations are caused, and a power supply is needed. For even higher powers (for example, several kilowatts), there are water-cooled beam dumps. Of course, their operation involves additional requirements, such as providing cooling water, safely avoiding any water leaks etc. In extreme cases, the absorption needs to be distributed over a larger volume. A possible solution is to absorb the light in a tank of water with added substances for obtaining an appropriate amount of absorption. Energetic pulses may damage a beam dumped even if the average power is within the allowed range! In any case, a high-power beam should not be sent into a beam dump with a too small beam radius, which would lead to excessive optical intensities. 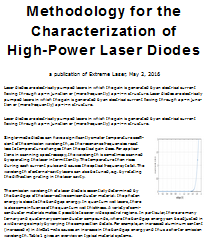 This is particularly the case for beams with high-energy pulses as obtained from Q-switched lasers. Such pulses may cause ablation or other kinds of degradation of the absorber material. Therefore, the specifications of beam dumps may contain limitations to the allowable fluence (in J/cm2) of pulses in addition to a limit for the average power. Permanently needed beam dumps should usually be rigidly fixed in the optical setup, e.g. using screws. It may also be helpful to obtain some heat flow from the beam dump into the base plate. In other cases, heating of the base plate may be unwanted (e.g. if thermal expansion courses misalignment of sensitive setups); one may then need to use a mount which minimizes thermal conduction. For other beam dumps, which are used only temporarily, it may be more convenient to use a magnetic mount, for example.